can I get Customised Blood Shield for next Patch?? CBS is a super rare equip. Maybe on December. I doubt if they'll put it next patch. Thank you for the current patch. You do realize the second one is sendind the link to the current gacha field 2 we have? I would like to suggest Happy bag 2013 290(M) for next patch. 2.Valentine Gift Box 2012 90. I've already suggested something, but, is it possible to also add the matrimony set on Gacha? They dont have these skill,they must have these skills. These bugs should be fixed. You are using the Tricksterlover wiki, PlayTO is not associated with other servers and there wikis. We do use the wiki to help provide players with links and info because it is the biggest online source for Trickster information available, but we do not own it and are not associated with it. Some information for the community if you do not already know: This server is Thai based and not everything is the same as eTO. We are actually a Thai server translated to look like the English server. All servers were different they all had there own coding language and there own events. 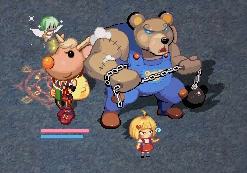 A lot of the items on our server including monsters will sometimes appear different from what is seen on the wikis. Why tweak things like this if they are not broken and work. They are different monsters from the wiki entirely. Items like this waste the Gms time to make needed improvements and distract us from our goals. Why fix things that are not broken. I hope this gives some players an enlightenment on why some changes and items appear the way they do. Have a good weekend Tricksters! 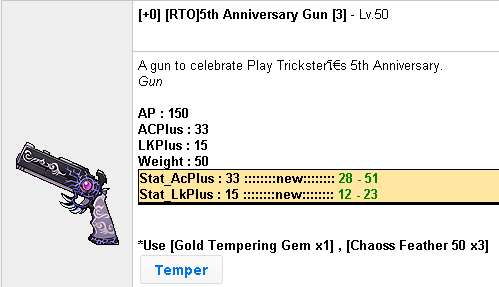 Hello, may i ask for the Drill gun to be purchasable again, or make a new gun with the same sprites/stats? As long as i remember i got mine last year from Leonardo's egg shop or Rosemary exchange at megalo shop, but after i reported a bug that makes the gun work like a dagger the item just got removed. -i remember there being a search function on eTO (when shopping) ? is it possible to introduce it here as well? -the game has been quite empty lately and it makes it hard for new players. maybe try to advertise it/ use SNS more(facebook,instagram and twitter) -maybe even hold small events when a certain number of likes/followers is reached- who knows what those likes and retweets could do ?! Answer: We won't increase the drop rate anymore. It was increased already. What you can try is suggest a specific item to be increased, not all of them. Answer: No, the game system was created like this, we are not going to change the original system. I don't even know if that is possible. Answer: I would like to reduce the sireng song cooldown too, idk if that is possible, but it is a good suggestion since pure cat doesn't have many aoes. Evolution is already a instant cast skill, so it's not necessary. same for metamorphosis, it isn't necessary to reduce it. Answer: We are actually working on it. We can't say when exacly is it going to be added to the game since we still have few bugs to work on. Answer: Those items have already had a price change and also a weight change. As I have said, we won't change how this game was made. It was made to be consumable. Answer: We have many players recording videos to post on youtube and all, but since it is not an official game, we can't announce it like offial server could. Answer: It was suggested before, I have suggested it before and many others tried to. Unfortunately it is impossible. The reason is because of our files. Our CT files comes from a different server where it was not possible to use those skills on CT. We can't break that code, at least not yet. Answer: Not necessary, and again, changing original system. Party quest is an awesome system already, there's no reason to change it. I was wondering if it is possible to make the invisible cape skin reveal tail/tail animations? As it is now, it has the appearance of back of character with no tail equiped~ thank you for consideration! some items should be increased in drop rate, like pencil box or theme spa items in general BUT instead, i'd like to suggest adding better reward. for example. key quest. at the end of key quest, give out large amount of Brooms would be very nice incentive (to me ). because of our generous TM leveling situation, TM quests are not very attractive, especially at higher level. SO maybe add like new item where u can get random skill master card. that way , (again for me) is more incentive to do. I noticed CT is just way better than doing quests. Questing is harder and slower, also slower due to lack of items floating in shops. so hopefully more incentives to rewards change that situation. No, the game system was created like this, we are not going to change the original system. Those items are special items, not supposed to be used in quests like that. Also, yes, I admit quests are harder and slower, but isn't that the fundamental of games? To finish quests and get rewards and all that call me old school, but that's the spirit of the game...I'd rather do that than grinding all day LOL just my opinion.